Thank You for early morning walks with dear and trusted friends! 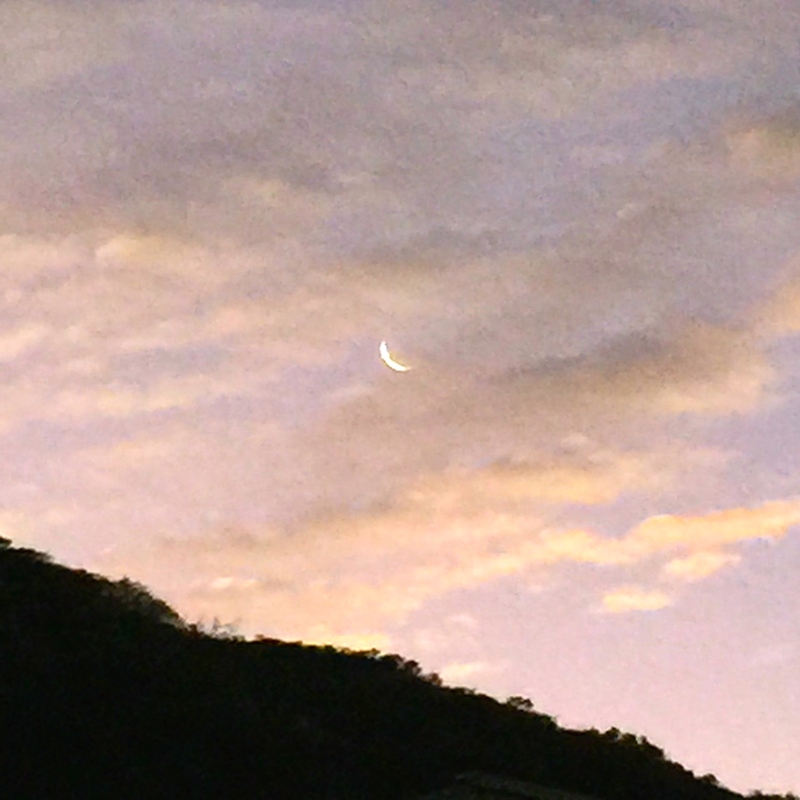 Thank You for thin crescent moons showing through the morning clouds. Thank You for this gift of Life! How appallingly easy it is to have my mind focused on small irritations. Now I can “think of it” as my Sympathetic Nervous System Mind. Not my Whole Mind! Not at all! It is the READY to FIGHT or FLEE or FREEZE operating system — OS SNS. I need it. I’m glad I have it. But, it is designed to be My Protector — Always On Guard — Ready to Defend and Repel. So, it does Critical and Negative really well. And it can be HYPERACTIVE too. Just recently I relearned that I have a second Operating System — the Parasympathetic Nervous System. — OS PNS That is the one that is ON while we sleep or are at rest. It is gentle and kind and loves to do cleanup. This is the OS that does Maintenance and Healing. And I am discovering that this operating system is designed to cleanup my Heart and Head as well as my Body. For example, yesterday, my wonderful husband, Kit, hurt my feelings. Not his fault . . . not really my fault either . . .but I was plunged into hurt, and anger and distress. Not a good place to be. Not where I wanted to be! And I remembered — if I just rest and breathe slowly I can shift out of IRRITATED and into RELAXED and PEACEFUL. I told Kit, “Just give me a few more minutes,” And very slowly my body shifted into OS PNS. PEACE RETURNED! I confessed and released my hurt feelings with explanations and apologies. Having a physiological explanation of what was happening made that shift so much easier. I could understand AND CHANGE my behavior without judging and scolding myself. Thank You, God!